I just finished reading Sam Apple's Schlepping Through the Alps after not being able to put it down for the last 150 pages. It is both a moving tale of Sam's search for Judaism (and anti-Semitism) in post-Holocaust Austria with the help of the country's last shepherd (a "wandering Jew" no less!) and a very funny journal of Sam's experience. Sam, the son of famous Jewish author Max Apple, really makes a name for himself with his first book and I for one can't wait for his next. 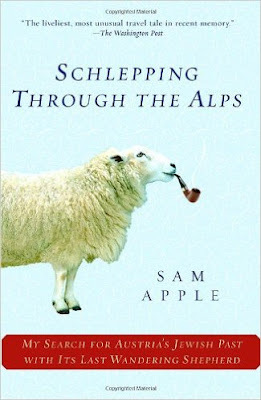 The Melton book club that I lead will discuss Schlepping Through the Alps at our next meeting in May and Sam has graciously agreed to join us via speaker phone from New York City. I hope to write a complete review of the book soon, but I can certainly recommend it to everyone without any reservation. You'll laugh, you'll cry, you'll want to go hug a sheep! To order the book, just visit this website and view the animation by Dan Meth.